Every summer I spend at least one week at the Lutheran camp with which my congregation is affiliated. During my six summers in Iowa our camp was Lutheran Lakeside Camp on the shores of East Lake Okoboji. Here in Idaho, I go up into the Sawtooth Mountains to Luther Heights Bible Camp. Why? It helps calm the fears of parents sending their children to camp for the first time. Campers from my congregation have an opportunity to interact with me in a new environment. It gives me a week to talk with college students, to provide pastoral care but also to find out what joys and concerns young adults have this year. As a camp board member I believe it is important to see and experience in action the organization I am serving. I go primarily because I love and believe in Lutheran Outdoor Ministries. 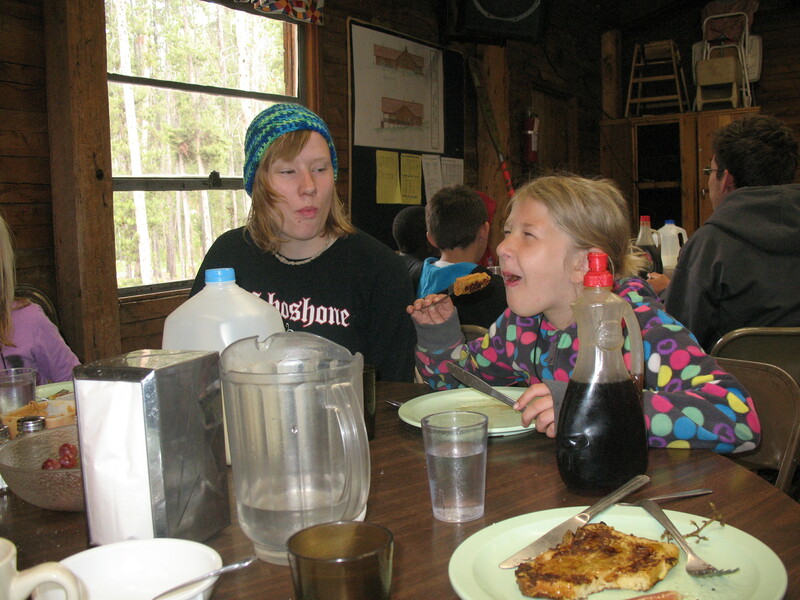 An important component of any camp is food service, whether in a dining room or on the trail. I have experienced everything–mac and cheese cooked over a Coleman stove, freeze-dried meals cooked over an open fire, granola and dehydrated milk, cakes baked in a reflector oven, pudding chilled in a mountain stream, floating lunches, buffet lines, family style, rows of rectangular tables, round tables, gourmet food, simple food, fresh baked bread, views of mountains, meadows, or lakes. I have eaten with my cabin group for an entire month and I have switched tables for every meal. At Luther Heights we eat family style around round tables. This lends itself to the very best conversations in my opinion. Counselors come in first and sit at their table and then campers enter and sit together with their counselor as cabin groups. Adults like me eat with cabin groups who have an extra chair at their table or we eat at the staff table. Every table has a server who delivers food from the kitchen counter. This prevents congestion and confusion and it gives campers and adults the opportunity to, as the title explains, serve the small group. 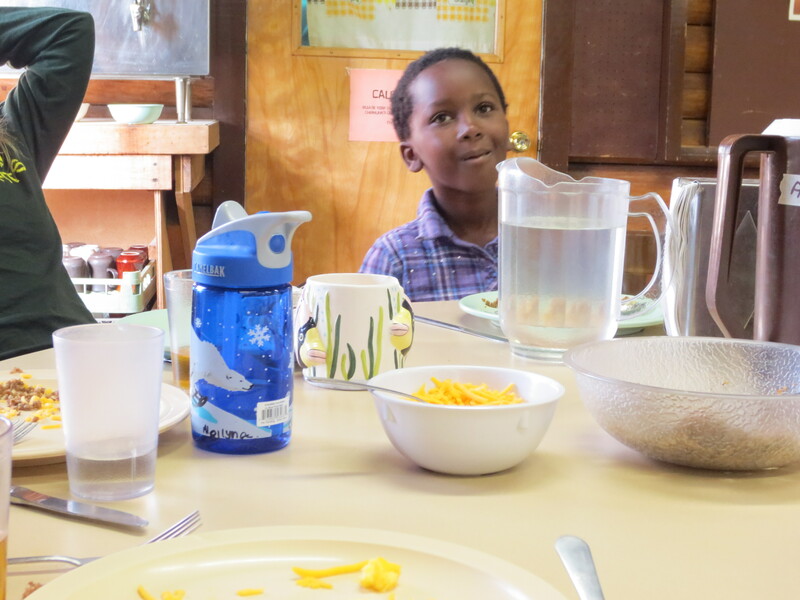 A different cabin group also serves the entire camp for each meal by setting up all of the tables. Many families try to eat meals together but with such programmed lives this can be an enormous challenge. And it is not as if the practice of eating together is nurtured in our society. How many films and television shows portray families of any kind sitting together around a table eating a meal? Occasionally we will see them at a restaurant or bar or coffee shop. Multiple ads show a mom or dad relieved to have discovered the newest breakfast, lunch, or dinner food that can be eaten in the car or at the bus stop. Rarely on the screen do we see families eating together around a table in the home. This makes the cabin/family meals at camp all the more significant. Here is a time and place where we sit with people who are at first strangers. We may enjoy their company and we may not. Either way, we are all around the table together and chances are that by the end of a week of conversations we will find a commonality. Better yet, we will have shared an experience outside of the dining hall that has bonded us despite our differences–an overnight, an arduous day hike, a game where we got covered in mud. We will pass the basket of bread. Before we have seconds, we will make sure that everyone who wants a slice can partake. After or before a full day of activities our caring counselor will remind us to drink lots of water. When the pitcher runs dry, someone from the table will refill it. At the end of the week the kitchen staff will parade around the tables. By then we will all know these people’s faces, if not their names. The whole camp community will give thanks for the ministry of food preparation. To be physically fed and nourished is always a gift. It is even better when we know and appreciate the people who have lovingly prepared our meals. And I give thanks to God every time I am able to sit with fellow and sister campers, strangers or friends, around a table and listen to their stories as we break bread together.